It is that time of the year again! You know, when Baha’is start wringing their hands about whether they should celebrate Christmas. Or just how much ‘celebrating’ is too much…is getting a tree too much? what about exchanging gifts? Oh my Gosh! What about sipping eggnog? In the Yahoo! Group: Unenrolled Baha’i there’s a discussion about the approach of Baha’is (enrolled and unenrolled) towards Christmas. And in the LiveJournal Baha’i forum there was a recent question about the same. Since I never officially celebrated Christmas with my family growing up, I don’t know what I’m missing. We never had a tree, never hung mistletoe, nor stockings. Our house was immaculately bereft of all festive paraphenalia. And yet, I never once got the impression that the celebration of Christmas by others (Christians, agnostics, atheists, Baha’is, etc.) was wrong or bad. Of course, I know that Shoghi Effendi gives guidance that Baha’is not celebrate Christmas but c’mon ! Asking Western Baha’is who have grown up seeped in the tradition of that jolly nordic saint with his toy sweatshop hidden in the arctic, is like asking Iranian Baha’is to stop celebrating Chahar-Shanbeh Soori. After all, they are both un-Baha’i; having nothing to do with the Faith and having both lost so much of their original significance. And yet, in both cases, people just can’t stop continuing the traditions. In case you’re not familiar with it, Chahar-Shanbeh Soori is an ancient festival (probably preceding Zoroastrian times) which literally translated means the Last Wednesday of the Year. There’s a lot of different activities (like Christmas) but the most famous one and the most visually spectacular is undertaken on Tuesday night. Imagine the streets coming alive with children and people as families spill out of their homes and greet each other. Soon fathers are seen congregating with sticks, tinder and other flammable objects. Before you know it, roaring bonfires are lit and people gather around them. Then suddenly someone is the first to go; taking a running start and jumping over the fire they yell ‘Sorkhie to az man… Zardieh man az to’. Literally: ‘Your redness to me … my yellowness to you’. This rhyme complements this ancient purification ritual where the healthy glow of the fire is beseeched to bless the person and to take away all their maladies and ills. 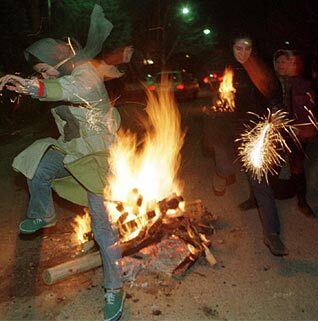 Another activity associated with Chahar-Shanbeh Soori is when people wear strange costumes – usually wrapping themselves up in sheets to symbolize the shrouds of the dead – and head out into the street armed with pots and pans to create a cacophony you will never forget. As the saying goes, they could wake the dead! And that’s pretty much the intention; this ancient ritual is said to ward off evil spirits. For their trouble the kids then go door to door and receive treats – heaven help the poor soul who isn’t liberal with the treats. They probably won’t be left alone to sleep a wink that night. And here you thought that the West had a monopoly on Halloween, didn’t you? 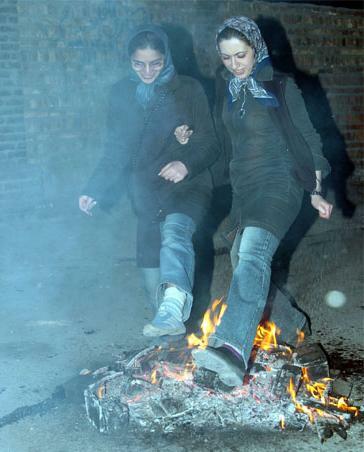 As you can well imagine, the fundamental Muslims in Iran view all of this as peccant pagan rituals which defile the Islamic purity in their society. For more than 25 years (since the 1979 revolution) they have made futile attempts to stop people from celebrating Chahar-Shanbeh Soori. They have beaten people, imposed curfews, thrown people in jail….all to no avail. This ancient tradition is just too deeply bred in the bone. Something ingrained in the psyche of the Iranian society for thousands of years can not be simply erased by two measly decades. So that’s what I think of when talk turns to Baha’is celebrating Christmas in the West. Isn’t it hypocritical that Baha’is in Iran celebrate by jump over bonfires and no one bats an eyelash but suddenly when the same Baha’i family comes over to the US they get all uppity when they see the North American Baha’is putting up and decorating a coniferous tree? That’s why I say, relaaaaaax. Chill out Dorothy! You’re not in Kansas anymore. Grab a cup of eggnog and learn a few of those silly Christmas carols. Then after its all over, see if you can suggest to your neighbourhood a new way to dispose of all those dried up Christmas trees (hint: tree=wood). Wikipedia article on Chahar Shanbeh Soori. An article explaining the different activities of Chahar Shanbeh Soori. Ah, er…God how do I tell you this? This may be a terrible shock..But…It is Tues, Dec. 14th. Not the 20th, 20th is NEXT Tuesday! You don’t say? My bad. I’m always a bit disoriented after I use the time machine. I mean, ermm…nothing… you didn’t read that. Now were we? Oh yes, umm.. Merry Christmas to you too! It happens every year. sweet unbidden messages via email about what Shoghi Effendi said about Christmas and about Baha’is not celebrating Christmas. I am a Baha’i. To not celebratre Christmas with my relatives would be paramount to becoming a major humbug. The confusion is this: Shoghi Effendi said that Christmas ceases to be an “instituition” for the Baha’is. That means Baha’is Assemblies don’t officiate or sponsor Christmas celebrations. It doesn’t mean that we lock ourselves in a closet at Christmas or Channuka time. For the comfort of my relatives, I have often put up a Christmas tree. There is nothing in the sacred books aagainst putting up a Christmas tree. It’s my call. Rather like the Baha’is who place trays of Haft Sin out at Naw Ruz. I wish we would stop beating each other up about how we individually chose to practice faith. I wish that next Christmas non one would remind what Shoghi Effendi said about Christmas. I wish that the ppl who send out such messages would smile, make shortbread cookies and invite a few Christians over for eggnog and relax.